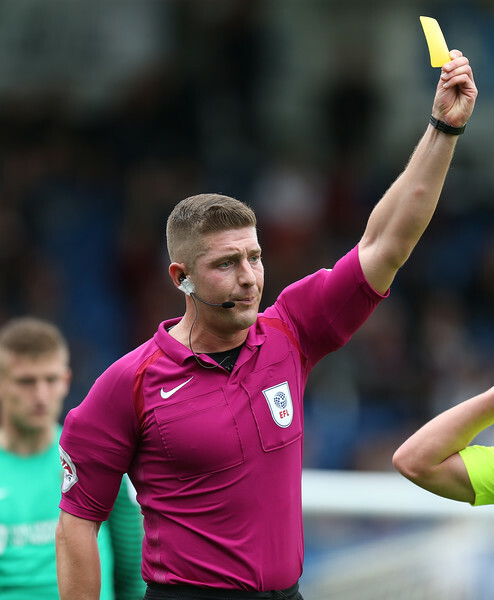 The Match Officials for the Bristol Rovers v Bury fixture have been announced. Saturday 10th December 2016. Kick Off is 3.00pm. This weekend Robert Jones will officiate at The Memorial Stadium for the first time. He has only been the referee for a Bristol Rovers match once previously. That match was on Saturday 27th September 2014 when Southport were beaten 1-0 at Haig Avenue. Jake Gosling’s 13th minute goal separated the two sides that afternoon. Assistant Referees: Marvyn Amphlett and Neil Radford. Robert Jones took charge of his only game involving Bury FC on Tuesday 30th August 2016. In that fixture Bury beat Morecambe 4-1 in the Football League Trophy. Zeli Ismail, Tom Pope with a brace and Anthony Kay secured the victory for the Shakers. To date this season Robert Jones has officiated in 21 League and cup games; mainly in Leagues One and Two . He has issued 71 Yellow Cards and just 1 Red card this season.